Sheri Lakes's well-used Ben Orford Craftsman knife. Photo: Paul Kirtley. Everybody has their own preference for what they want in a knife for bushcraft, but it may surprise you I'm not about to claim that the knife I chose does everything. My first knife had been an Opinel No.7 folding knife. This was initially because I was only practicing bushcraft in my garden, and this was a more practical knife for the tasks I needed it for at work while working on the nature reserve. It fitted snugly in my pocket, so I wasn't worried about losing it. It was perfect for cutting string and for taking plant cuttings. It could also be used for carving. There was very little I couldn't do with it, but I was worried about the strength of the blade as I got more interested and more involved with bushcraft. It was after attending the Elementary Wilderness Bushcraft Course at Frontier in 2012 that I realised that there was more potential with what I could do with a bushcraft knife. Being given a Mora as part of the course showed me that having a longer blade, as well as a stronger one was very useful for many tasks! That being said, I do still carry my Opinel, as it handy as a pocket knife, but it is not the one I choose to take into the woods anymore. Shortly after the course I realised that I wanted to take this "bushcraft stuff" a bit more seriously, and began to look around for a new bushcraft knife of my own...something that was comfortable to use, light yet effective. A little bit of me wanted it to look nice too! I realised I enjoyed doing a lot of carving projects and therefore when I use my knife I tend to be using it for prolonged period of time. I am only a small person and, having limited wrist strength, I wanted a light knife. 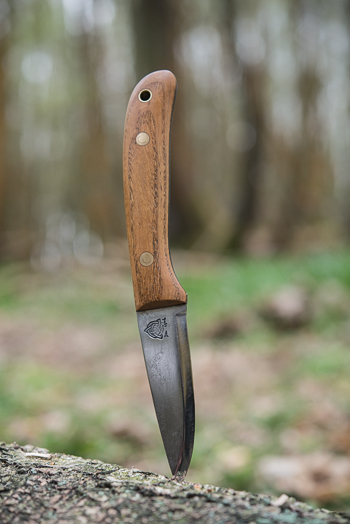 A colleague of mine had recently bought the Woodlander knife from Ben Orford, with a walnut handle. It was a lovely knife, with a 4 inch long blade made of 4mm thick carbon steel and he was nice enough to let me use it. However, it quickly became very apparent that it was too heavy for me. After about 10 minutes my wrist was aching, and I just didn't have the control with it. Having said all that, I loved the craftsmanship of the knife; it looked great and felt great in the hand. So I did a little research into the knives that Ben Orford makes. At the time he had just stopped taking orders (which was gutting) but at least it gave me an idea of the sizes and weights of knives to look at because I had held a knife to gauge it by. I certainly wasn't going to rush into buying a knife. I wanted it to be an investment. There were two knives made by the same man which were much smaller than the Woodlander- the Craftsman and the Pixie. Originally I thought I wanted the Pixie, but as I considered it realised it might be a little too small for what I wanted to do with it. The Craftsman unsheathed. Photo: Paul Kirtley. By chance, within a couple of weeks of first looking, a Craftsman came up on the 'Knives For Sale' section of the website. I still wanted to check it was the right knife for me. It was a 3inch blade, 2.2mm thick, carbon steel, full tang blade. I've always liked lighter coloured woods, and the scales on this particular knife were made of ash. Not only is ash light in colour but it is also my favourite wood to work with (and coincidentally the first spoon I ever carved was ash). This knife is probably a lot smaller than some of those which many of you reading this will own, but for me it is the perfect knife for carving, which is what it is designed for. The handle is 4.4 inches. With my palm being less than 3 inches across, this is a really comfortable grip for me, as the handle circumference is also just under 3 inches - I don't know whether this is a correlation... but it certainly is comfortable to my hand. The back of the blade is rounded off. This is great for comfortable carving as extra pressure can be applied using my left thumb, which makes a lot of find work relatively easy. This however does have a drawback, I've found. When making willow cordage earlier this year it was impossible to take the outer bark off with the back of the blade, and I had to resort to using the back of my Laplander saw. This wasn't a problem in the situation that I was in but proved that this knife wasn't going to do everything. Detail of the logo on the blade. Note also the rounding on the back of the blade. Photo: Paul Kirtley. Due to the blade being shorter than a number of knives of the market it is also quite difficult to baton wood that other larger blades will take in their stride. I have become talented in the art of making wedges, for when, not if, my knife gets stuck. I don't want this to be a negative point, however, as I bought the knife for carving, which it does very well. All this being said, the balance of the knife is great and it is so comfortable to use. I find it easy to sharpen, and for this I use a 1000/3000 grit water stone when at home or in the office, or a DC4 when I'm out in the woods. 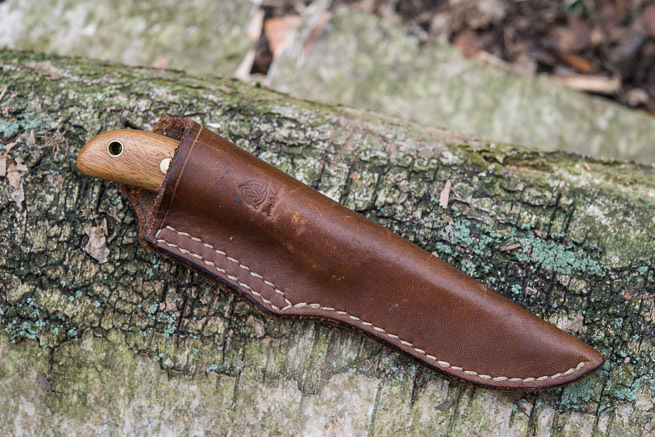 The sheath which the knife comes in is a beautifully crafted leather sheath made by Lois Orford. They are wet moulded to each knife that is made to ensure a natural locking system which will hold the knife in the sheath. I've had to remould it once, but with it being leather this is fairly easy to do. The after-service with this was brilliant. When I wasn't sure how to remould it, Lois was very approachable and explained the technique to me. I wear my tools on my belt (this includes my Laplander Saw) as I find this easier for accessibility when I am out working. I am forever changing the layers I wear in the woods, so it's ideal that I can still get to my knives on my belt whether I am in a t-shirt or my coat! 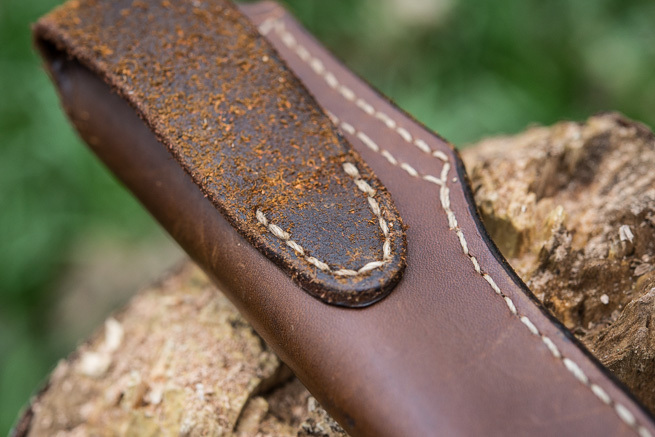 Detail of the stitching on the reverse of the leather belt sheath, hand made by Lois Orford. Photo: Paul Kirtley. I have, very recently, bought a new companion knife for my craftsman. Since I first bought this knife I have become more used to working with knives of this type. So I have decided to invest in a new knife. I have, once again, gone to Ben Orford's Craft Lab and bought a Woodlander knife. The weight of this one seems much lighter than I remember the one I held two years ago being. The unpolished carbon steel blade is 3.5mm thick, but still 4 inches in length. Instead of the wooden scales, this knife has scales of natural coloured canvas Micarta, which is made from layers of canvas stuck together with glue under high pressure. I am yet to have a chance to properly use this knife. I'm sure it won't be long though - perhaps even after I have finished writing this! So far, though, I can say it is lovely to hold. Yet again the balance seems perfect. I am expecting the longer, thicker blade will be more suited to batoning and more robust in certain tasks. My Craftsman is likely to remain my knife of choice for the mainstay of the tasks I conduct with a knife. It is a knife that suits me! The author's Opinel No. 7 along with her Ben Orford Craftsman and Woodlander bushcraft knives. Photo: Sheri Lake. Sheri has been a member of the Frontier Bushcraft instructional team since 2013. She is committed to helping children and adults experience the outdoors. When Sheri is not working on Frontier courses, she is an Education and Community Officer with Lincolnshire Wildlife Trust. On a daily basis she can be found out and about on the nature reserve and working with school groups. Sheri is a fantastic asset to the team and the first person we ask about any sort of insect or bug. Nice choice, looks like a good performer! Ben Orford sure makes clean knives. My girlfriend also needed a knife that was more suited to her needs (smaller hands, lighter). She uses the Fallkniven WM1, Enzo Elver or her all-time favorite, Helle Harding. The WM1 and Elver are perhaps a bit too small, the Helle has a somewhat shorter handle but still a blade that is long enough for batonning and such. 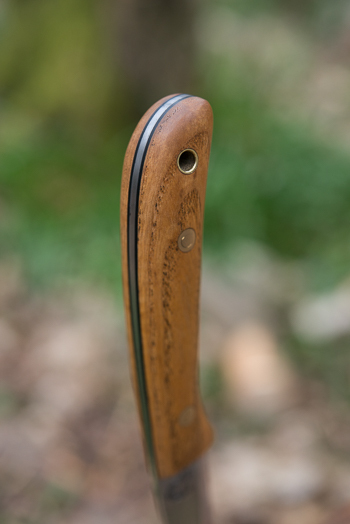 The fact that the Helle has some sort of stainless steel helps a lot too. Thank for your comments. It’s comforting to know I’m not the only one who has to search for a slightly smaller knife. I’ve never held the ones you mention, but might have to find them out! 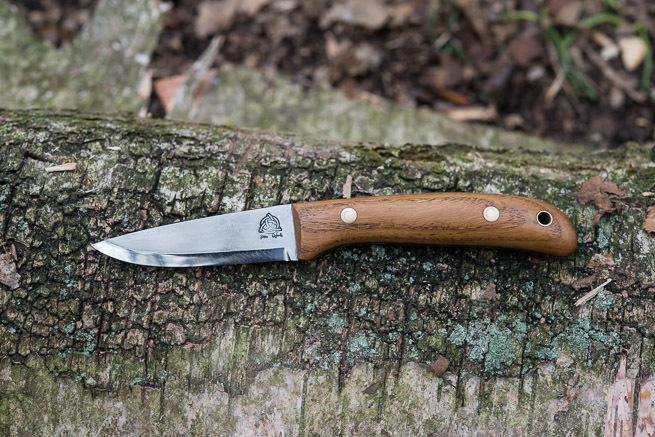 The woodlander looks like a really lovely knife and I like the fact that it has a decent girth to the handle as I find that many smallish knives often have to thin a handle making them quite uncomfortable to use for extended time. I have to admit I have always veered towards the ‘survival/buschraft knives’, as I like their robustness and the fact that I do not have to be precious with them. I have gso 4.1 which has a saber grind. I know that scandi grind are the best for bushcraft, however, I have found that the saber grind does a decent job now that i have slightly changed the angle of the bevel. i also have a companion knife with a small 2.5 inch knife for detailed carving work, ( though I am a beginner at that!). I can see why people get a bit obsessed by knives and styles etc.. as I find myself always interested in other peoples favourite knives! Well done on your choice! I am lucky enough to have both a Woodlander and a Craftsman, both of which I absolutely love. 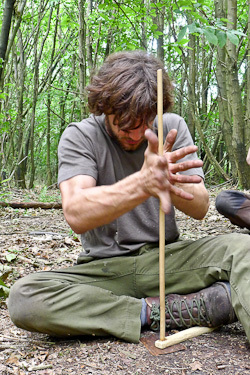 I am currently saving up for one of Ben’s Campcraft knives which, with a squared off back, would make prepping cordage easy while still being light enough for other craft and woodland tasks; the sharper point on it would be useful, too, for other craft-oriented tasks. I do love the unground finish on your Woodlander. Sadly, Ben wasn’t offering that when I picked up mine all those years ago! 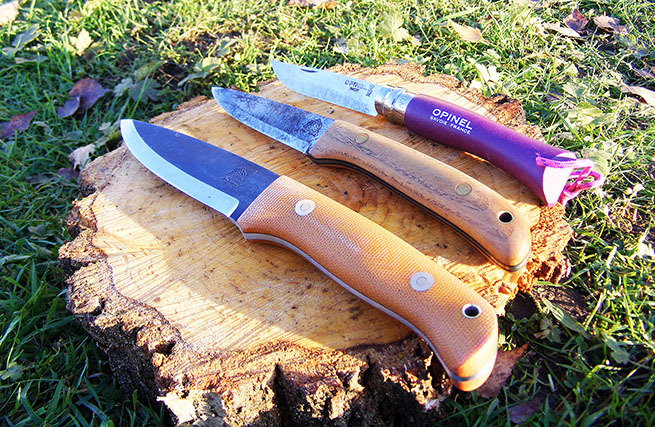 I hope that you enjoy using both your Orfords – they are great knives which will easily outlast their owners! 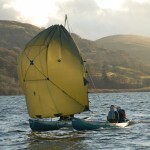 Great article, I really like the look of the Craftsmen and Woodlander. Are they both carbon steel or stainless steel? I’m in the same position as you were in that I’m looking to get a knife having recently started taking ‘byshcraft serious’ and can’t decide between the two blade choices. You be glad to know I’ve spoken to Ben to commission a couple of knives. I’m unsure whether to have polished finish or unpolished… Any thoughts..
Good choice John! To be honest I prefer the finish on my unpolished one. It’s a matter of taste really!